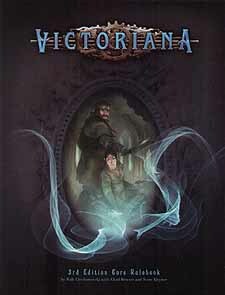 Victoriana - a world of high adventure and intrigue in an age of sorcery and steam! Your adventurers will take you into an alternate history infused with fantasy and esoteric steam technology. Aerostats float across the sky as noble Eldren chat with industrial Dwarfs. The Age of Magic may be long gone, but the Guild keeps its embers alive while technologists create extraordinary mechanical marvels. Victoriana 3rd Edition is backwards-compatible with the previous edition - your 2nd Edition supplements can be used with the 3rd Edition rules.